Partnering with Hamel Builders has been a source of pride for the entire Anderson Fire Protection family. We believe in giving back. In fact, we decided to put together a back to school drive for the community. 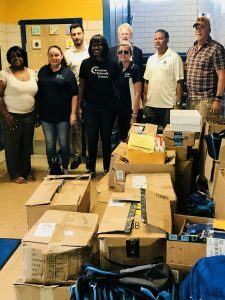 All the school supplies and clothes that we received went directly to Harlem Park Elementary and Middle School in Baltimore, Maryland. AFP and Hamel believe the importance is recognizing the needs of the community are integral to life. Every student deserves to have the basic necessities needed to thrive in their surroundings. Providing school supplies and other necessities allows them to do that. With the ability to gain skills, knowledge, and expertise, students are able to learn and focus when they have everything they need to do so. Giving time to volunteer is crucial for your happiness. It makes you feel good and allows you to become more connected to your own community. Giving back is a great way to learn about people that may be different from you. Making connections is important to a healthy life. In fact, giving back and volunteering can help you create and develop social connections with those living in your community. It’s easy to cultivate your inner social butterfly by getting out there, giving your time, and helping those in need. It’s important to give back to the community when you can. In fact, by volunteering you are showing how much you appreciate your community. There really is no better feeling than showing your community how much you care about them and their well-being. Anderson Fire Protection is more than just a fire protection company. Giving back to the community is integral to our company. We have the expertise and skill to help with all your Life Safety needs. We have been working in the Maryland, Northern Virginia, and Washington, D.C. areas for over 25 years, and we are known for our top-notch customer service and high-quality results. If you are ready for fantastic fire prevention and protection services, from fire sprinkler installation to fire alarm design and consulting, give us a call at (410) 796-4915 or visit us online. For more fire safety tips to keep your property safe, follow us on Facebook, Twitter, LinkedIn, and Google+. This entry was posted on Friday, September 21st, 2018 at 9:31 am. Both comments and pings are currently closed.